What do you do when you're far from home and haven't got room for a tree? Or when it's the night before the annual end-of-year office party and you haven't got a clue what to give your holiday exchange giftee? 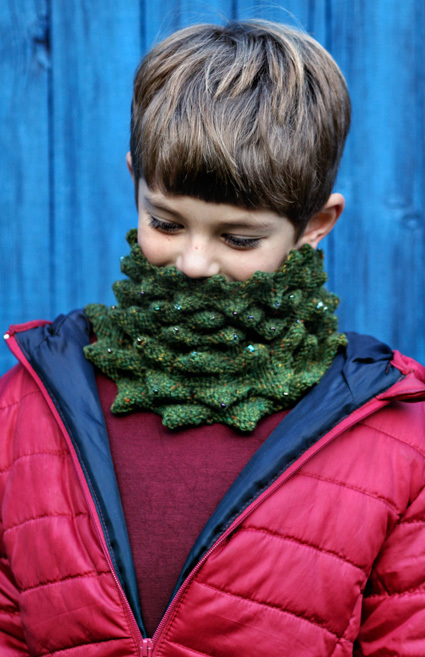 You knit up one of these. 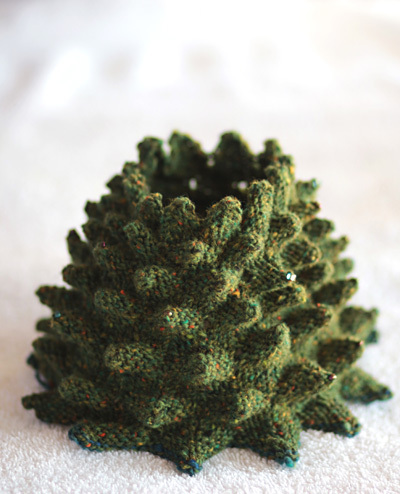 Tree is a toasty cowl that doubles up as a miniature tree. Beads on the tips of the branches add a festive air, and its flared shape helps it sit nicely on the mantelpiece or the shoulders. The stitch pattern is very simple. The same basic row is repeated for a gradually increasing number of rows and then alternated to create points in the fabric. The stitch marker jumps around most rows like a little squirrel, and when offsetting or increasing, the first or last repeat of the row sometimes takes some attention, but other than that it's a straightforward, engaging little knit that can be finished in a day. 72 6/0 beads: choose beads that contrast with your yarn – mixed colors work well. Beads shown are iridescent plum and grey. Note: Exact gauge is not critical for this project, but working at a different gauge will affect finished size and yarn usage. This stitch pattern uses a short sequence of increases and decreases which are stacked vertically for a certain number of rows. 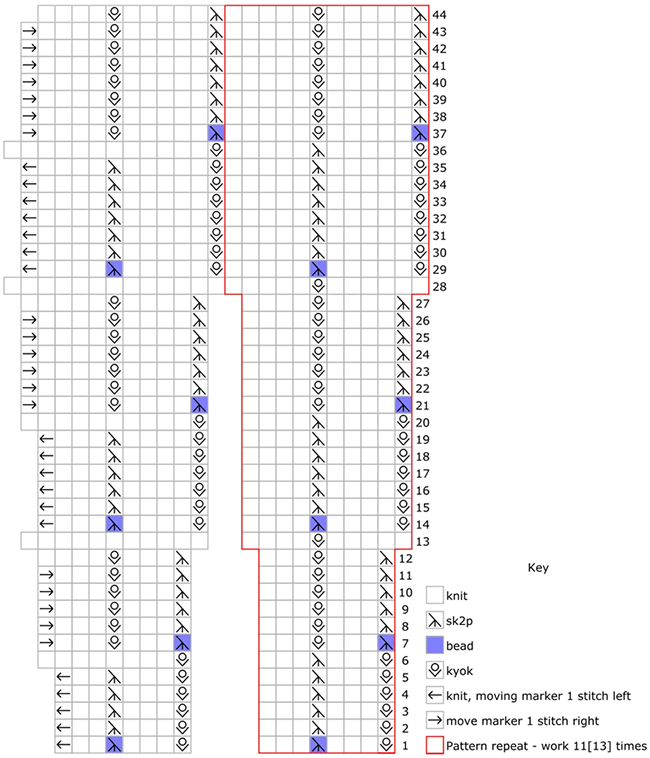 In each set, the kyok should be worked into the central yo of the kyok below, and the middle st of the sk2p is the top of the decrease from the row below, and then this pattern is offset so that the increase and decrease columns are swapped over. Note that when offsetting (e.g. rounds 7-12), in the last repeat the kyok will be 1 st to the right of the decrease. The base pattern is a 10-stitch repeat and the CO is a multiple of 10 stitches less one. As you work, and the stitch count and repeat size increases, you’re always one stitch short of a full repeat. This is so that the start of round shifts to maintain the proper pattern alignment. The use of the marker is important, to help you keep track of where you are. For some rounds, you will be working 1 stitch past the start of the round, and replacing the marker at that point – moving the stitch marker one stitch left. For other rounds, you will move the marker right, to before those final stitches. Because of this, it’s best to use a removable stitch marker for the start of the round. Length can be adjusted by casting on more or less repeats of the lace pattern, in multiples of 10 sts. 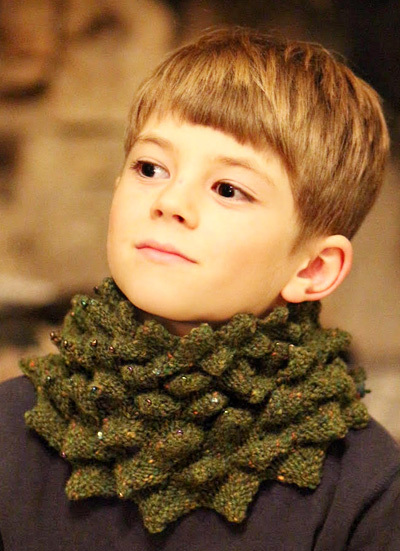 Each repeat adds approx 1 inch to the width of the cowl, and requires about 11 yds of yarn. The small size (pictured) uses 135 yds, and the large uses 157 yds. Casting on and binding off with larger needles allows the edging to form points, and helps prevent rolling. You can alternately use Jeny’s Surprisingly Stretchy BO, but you don’t need to use the larger needle for this. kyok: (K1, yo, k1) all into the same st, making three sts from one. sk2p & bead: work the decrease, and then use the crochet hook to place a bead on the resulting stitch, place bead on crochet hook, use hook to lift st just worked off the needle, slide bead onto st, then replace stitch on right needle. Using larger needle, CO 119 sts. Place marker and join for working in the round. Change to smaller needle, and work Pattern (from chart or written instructions) around. Rnd 1: [Kyok, k3, sk2p & bead, k3] 12 times, shifting marker 1 st left to work final st in rnd. Rnds 2-5: [Kyok, k3, sk2p, k3] 12 times, shifting marker 1 st left to work final st in rnd. Rnd 6: [Kyok, k3, sk2p, k3] 11 times, kyok, k8. 121 sts. Rnd 7: [Sk2p & bead, k3, kyok, k3] 12 times, this is the start of new round. Shift marker 1 st right to this position. Rnds 8-11: [Sk2p, k3, kyok, k3] 12 times, this is the start of new round. Shift marker 1 st right to this position. Rnds 12: [Sk2p, k3, kyok, k3] 12 times, k1. Rnd 13: [K5, kyok, k4] 11 times, k11. 143 sts. Rnd 14: [Kyok, k4, sk2p & bead, k4] 12 times, shifting marker 1 st left to work final st in rnd. Rnds 15-19: [Kyok, k4, sk2p, k4] 12 times, shifting marker 1 st left to work final st in rnd. Rnds 20: [Kyok, k4, sk2p, k4] 11 times, kyok, k10. 145 sts. Rnds 21: [Sk2p & bead, k4, kyok, k4] 12 times, this is the start of new round. Shift marker 1 st right to this position. Rnds 22-26: [Sk2p, k4, kyok, k4] 12 times, this is the start of new round. Shift marker 1 st right to this position. Rnd 27: [Sk2p, k4, kyok, k4] 12 times, k1. Rnd 28: [K6, kyok, k5] 11 times, k13. 167 sts. Rnd 29: [Kyok, k5, sk2p & bead, k5] 12 times, shifting marker 1 st left to work final st in rnd. Rnds 30-35: [Kyok, k5, sk2p, k5] 12 times, shifting marker 1 st left to work final st in rnd. Rnd 36: [Kyok, k5, sk2p, k5] 11 times, kyok, k12. 169 sts. Rnds 37: [Sk2p & bead, k5, kyok, k5] 12 times, this is the start of new round. Shift marker 1 st right to this position. Rnds 38-43: [Sk2p, k5, kyok, k5] 12 times, this is the start of new round. Shift marker 1 st right to this position. Rnd 44: [Sk2p, k5, kyok, k5] 12 times. This leaves you one stitch before the existing start of round marker. Remove the marker, and then use this stitch to start the bind off. 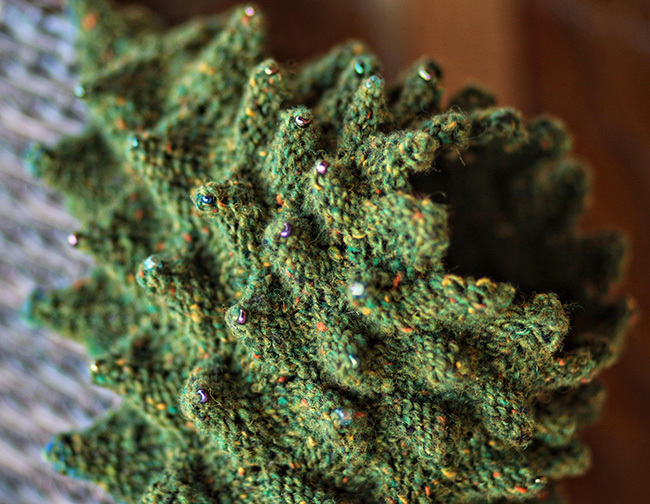 Change back to larger needles and bind off using your preferred stretchy bind off. Turn inside out, or pop the points out to the stockinette side. Block gently if you wish, laying flat and poking out the points if they flatten out. 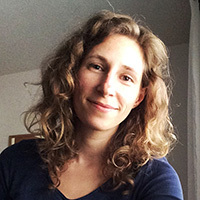 Nim is a laceaholic who knits in search of (elusive) sanity and can still be found up to her elbows in yarn and pointy sticks even while travelling the globe in a very small campervan for a year with 3 young (grubby) children.